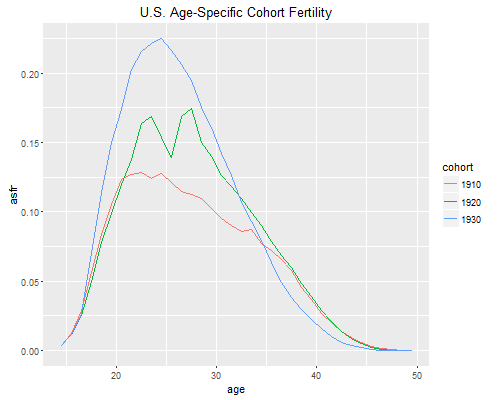 We will use the Heuser cohort fertility tables available in the OPR data archive to have a look at fertility in the U.S. between 1917 and 1980. 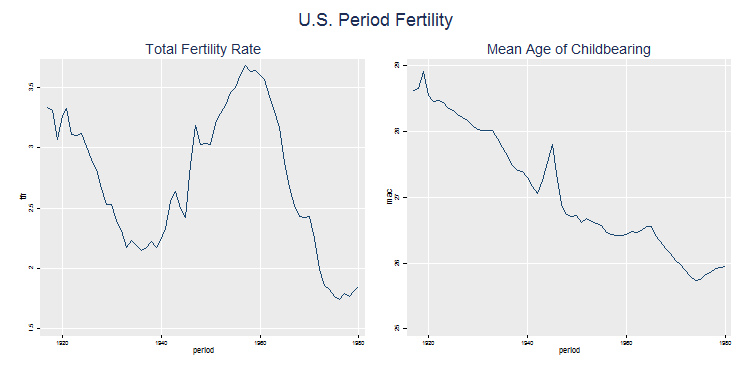 For a much more extensive analysis see the paper by Schoen (2004) "Timing Effects and the Interpretation of Period Fertility", Demography 41(4):801-819, available in JSTOR. 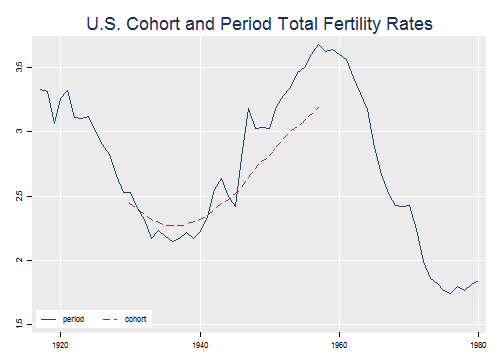 Also, the human fertility database has data for 1933-2013 and can be used to extend this series to the more recent past. I did some preliminary work to put the archive data in a more usable form. 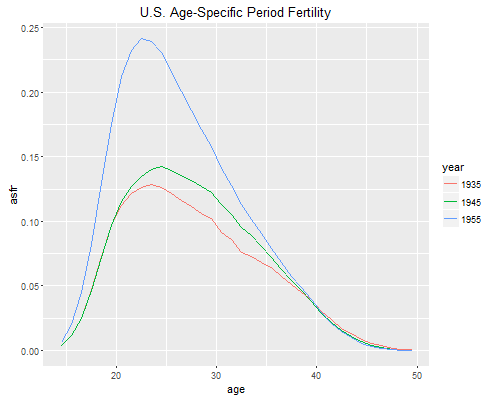 The file heuser.dat in the datasets section is a 36 by 64 matrix of single-year age-period rates for ages 14 to 49 and years 1917 to 1980. This is easy to read into our software. 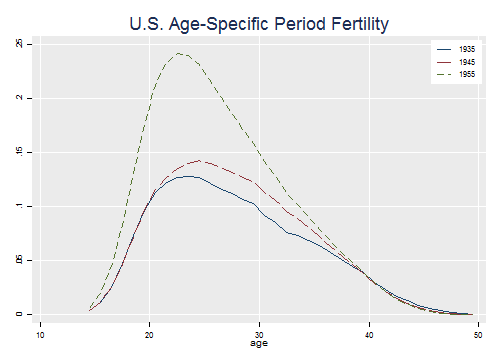 In the sections below we will be looking at period and cohort fertility but it is important to remember that we are dealing with an age-period-cohort surface. In class we will use dynamic 3-D graphs to explore the entire surface. The TFRs shows an increase over these years, from 2.2 to 3.5 children per woman. 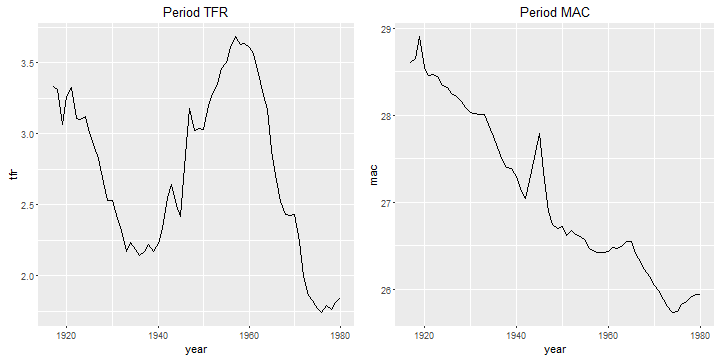 Let us compute the TFR and the mean age of childbearing for all years (named tfr and mac). 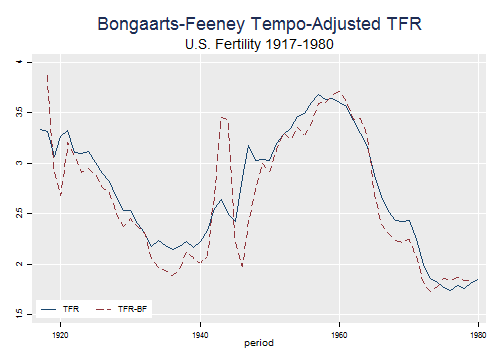 We see that the decline in fertility betwen 1920 and 1940 was followed by the famous baby boom, while period mean age of childbearing declined steadily except for a blip after the war. 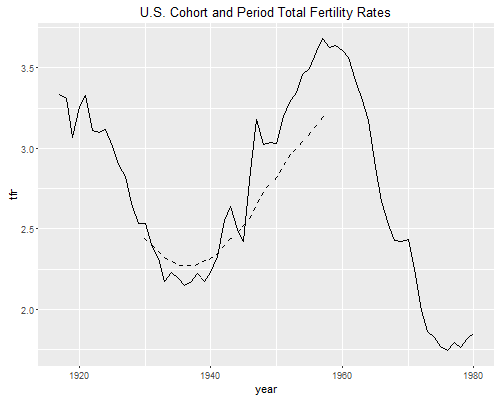 The data contain the complete fertility experience of 29 cohorts, starting with the cohort of 1903, aged 14 at the start of the series in 1917, and ending with the cohort of 1930, aged 49 at the end of the series in 1980. 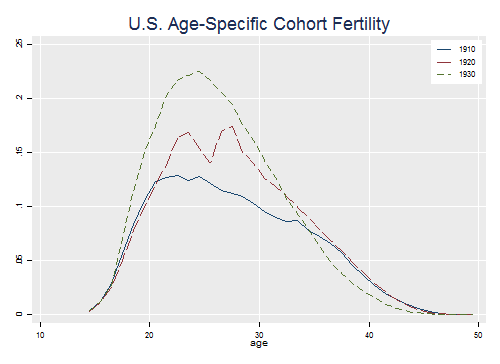 As you can see, the story from the cohort perspective looks a bit different, particularly in terms of mean age of childbearing, which increased and then declined steadily. How can we reconcile these results? 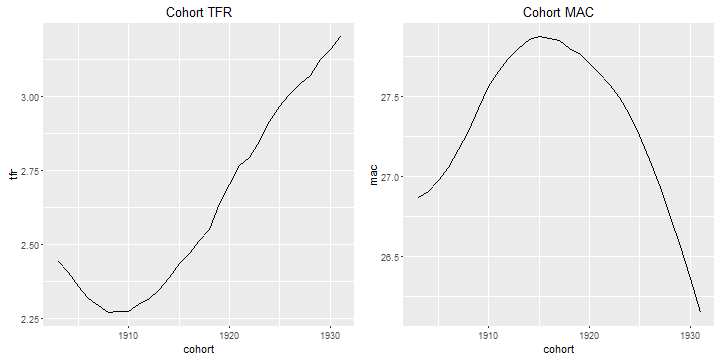 Let us start by plotting the period and cohort TFRs on the same graph. 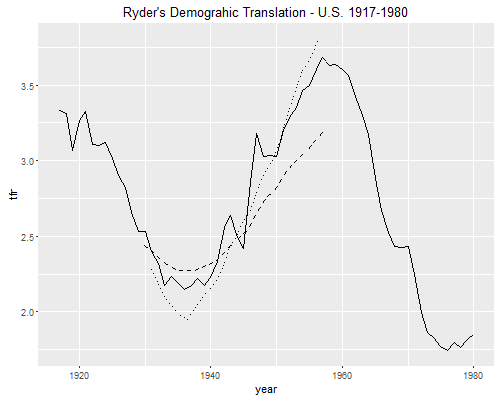 To do this we follow Ryder in dating a cohort's fertility using its mean age of childbearing. 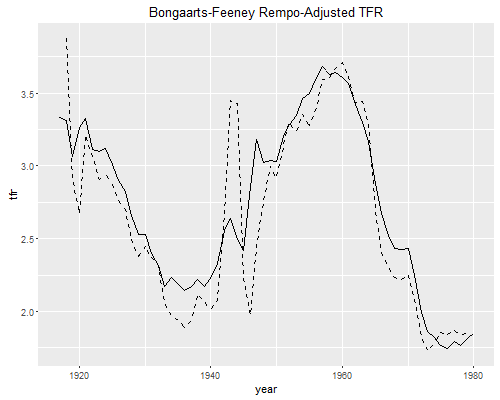 The cohort of 1903 had a TFR of 2.44 with a mean age of childbearing of 26.9 so we plot this TFR in 1929.9. 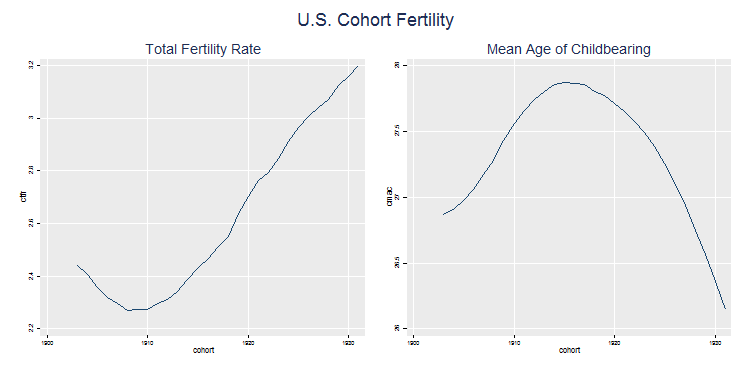 We see that period fertility was lower than cohort fertility when the cohorts were delaying childbearing, and higher than cohort fertility when the cohorts moved childbearing to younger ages, leading to the babyboom. This, of course, is exactly what one would expect from first principles. with all cohort quantities evaluated for the cohort reaching its mean of childbearing in the period of interest. We can easily see how well this works, bearing in mind that a first order approximation will be exact only if the rates change linearly over time. 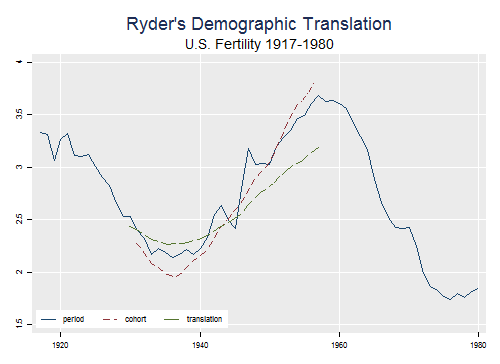 The translation is smoother than the observed period TFR but seems to track it reasonably well, usually identifying correctly times where the period TFR is above or below the completed family size of the relevant cohort. Let us calculate this measure to see what it does. Note that B-F prefer calculating the adjustment separately by birth order using rates that divide births of a given order by all women. I will simply use all births and refer you to Schoen's paper for the results using B-F's preferred method. The paper by Keilman discusses the use of hazard rates. Reassuringly, these results agree exactly with Schoen, as you can verify by listing a few values. He calls TFR the B-F preferred version and TFR* the simpler version used here. Comparing his Figure 1 with ours we see that both adjusted TFR's behave similarly, although the preferred measure seems a bit less erratic than the simpler one. I'll let you draw you own conclusions from the graph. Bear in mind that the adjusted TFR is a pure period measure and does not try to estimate cohort quantities. It can be interpreted as a counterfactual measure, what the period TFR would have been if women had not changed the timing of births. It is also the number of children a synthetic cohort would have if the period rates continued to shift at the same rate. In both cases the interpretation relies on a period shift model, where all women delay or anticipate childbearing at the same rate.